Improved asset quality and strong mortgage growth will continue to drive Irish lenders' profitability in 2019, overcoming expected regulatory headwinds from the central bank's tracker mortgage investigation, analysts said. Margins are on the rise at Ireland's three largest commercial banks, Allied Irish Banks, Bank of Ireland and Permanent TSB, while bad loans are down, said Philip O'Sullivan, chief economist at Investec in Ireland, with Permanent TSB cutting its NPL ratio to 9.5% by the third quarter of 2018 from 24.88% in the first half, after selling off 70% of its bad loan book. AIB plans another sale in 2019, aiming to bring in €1.4 billion for a €3.4 billion bad loan book, which Diarmaid Sheridan, a research analyst at Dublin-based stockbrokers Davy, called "a significant stride toward achieving the bank's 5% nonperforming exposure target by the end of 2019." Part of the reason for these shifts is Irish GDP growth, which Ireland's Central Statistical Office said came in at 7.4% in the first nine months of 2018 compared to the same period of 2017 and at the very top end among European countries. O'Sullivan said this growth pushed mortgage lending up 20% in 2018, with new lending projected to grow from €8.7 billion in 2018, to €10 billion in 2019, and €11.4 billion in 2020. The growth in Irish lending has also allowed the banks to improve asset quality without affecting their capital, said Investec equity analyst Owen Callan. S&P Global Ratings and Moody's took positive ratings actions across the Irish banking sector in December 2018: Moody's upgraded Bank of Ireland on Dec. 11, and on Dec. 17 S&P boosted AIB's long term issuer credit rating to investment grade and raised Permanent TSB's holding company's to BB-. 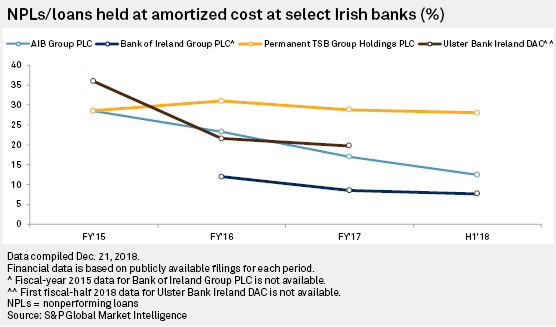 Callan said the ratings moves reflected "wholesale funding access all of the Irish banks have been able to demonstrate, and the more proactive approach some of them are taking in reducing NPLs." The largest two banks also have fresh leadership teams. In October 2018, Francesca McDonagh completed her first year as group CEO of Bank of Ireland, launching an organizational restructure in which she promised to cut the bank's red tape. AIB, on Dec. 14, announced the appointment of new CEO, Colin Hunt, which O'Sullivan called "a welcome boost" after the departures of CEO Bernard Byrne and CFO Mark Bourke. These improvements in asset quality, and the lack of domestic competition, will offer Ireland's three largest banks timely help given that "several key post-[financial] crisis developments are likely to come to bear in 2019," said Constantin Gurdgiev, an economics professor at Trinity College Dublin. Gurdgiev said these 2019 headwinds included pressures from regulators to resolve the long-term and unsustainable mortgages still on banks' balance sheets, and the final resolution of the Central Bank of Ireland's tracker mortgages investigation. Central bank Governor Philip Lane warned banks face multimillion-euro fines early in the year, as his regulator concludes enforcement investigations in a €1 billion scandal which began in 2015 and expanded in August 2018 to encompass 38,400 cases. The central bank indicated in 2018 that it had commenced enforcement proceedings against six banks, which may face fines up to the greater of €10 million or 10% of the previous year's turnover under the Supervision and Enforcement Act adopted in 2013. Gurdgiev, however, expected banks' "key risk" was more from potential legal actions by mortgage holders than penalties. "[I]t is more likely than not that the central bank will play its usual role of accommodating the banks." Their good capital position helps banks which have wildly varying amounts of cash set aside for penalties from regulators or the courts, he said. Bank of Ireland said in July 2018 that it had used all but €64 million of its £158 million initial tracker mortgage investigation provision for redress and compensation for affected customers. AIB said in July it had spent €131 million of its initial €135 million provision in payments to customers, and indicated it had set aside another €14 million provision for penalties. Permanent TSB increased its €36 million tracker mortgage provision by a further €15 million in July, and said there could be "material adjustments to the provision in the future." 2019 will see new entrants attempting to win market share from the established banks, though O'Sullivan expected limited danger for the big three. An Post Ltd., the Irish post office, is searching for banking partners including Spain's Bankinter SA, which established an Irish foothold in September 2018 by purchasing Leitrim-based credit card provider AvantCard, and indicated its intention to undercut banks' mortgage rate by 1%. Irish banks charge 3.08% average interest on new mortgage loans, according to the central bank, higher than the eurozone average of 1.76%. Sheridan was skeptical that new competitors could offer much improvement on lending rates, saying the European Banking Authority's risk-weighted asset models review penalized Irish banks for their crisis default experience, with Irish banks' risk weights set to increase to 48% from their current 38%, versus European banks' average of 20%. "Higher risk weights equal higher mortgage rates," said Sheridan. For financial highlights of banks you follow, search for the company in the top search box and go to the "Financial Highlights" section, housed under the Templated Financials on the left-hand panel. Here are financial highlights for Permanent TSB Group Holdings PLC. Click here to set up real-time alerts for data-driven articles on any region. Descriptions in this article were not prepared by S&P Global Ratings. To read the full S&P Global Ratings report referred to in this story, please click here.